Lentils are a good source of fiber. The end. Okay, sadly that was about all I knew about lentils before starting this week’s culinary journey and I only knew that because I read it on the package of lentils. I’ve never cooked with them, knew they were a really healthy food to incorporate into my diet, and therefore they were the perfect thing for me to cook and blog about. 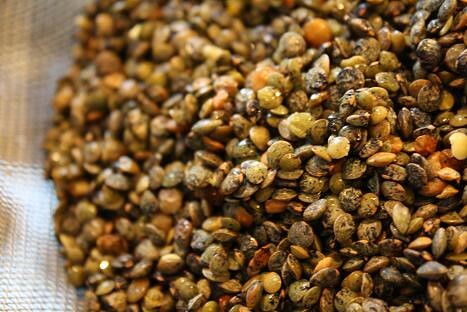 Rinsed French Green Lentils…they almost looks like pebbles, don’t they? Gorgeous! So let’s talk lentils. They are a bean and are easily found in dried form in the grocery store. I opted for the French Green Lentil variety for this week’s recipes, which I found at Whole Foods and you can see above…aren’t they lovely?! I picked this variety after reading all 3 recipes I chose and seeing that this type of bean holds up well through the cooking process. As I mentioned previously, they are high in fiber and are a great option for all of the vegetarians out there. I’m sure I’ve eaten lentils before (and probably didn’t realize it), so I wanted to try them in a few different recipes and form a stance: Either I like lentils or I don’t…it’s time to find out. The reason I was questioning if I would like lentils is because when I told my mom that I was cooking with them this week, her reaction was priceless. A turned up nose and a simple statement of “I don’t like lentils” made it clear she was not a fan. So then I thought that it would fun to find a recipe(s) that would make her see lentils in a new light. So this post will chronicle my attempts and provide you with the recipes I tried and the outcome. 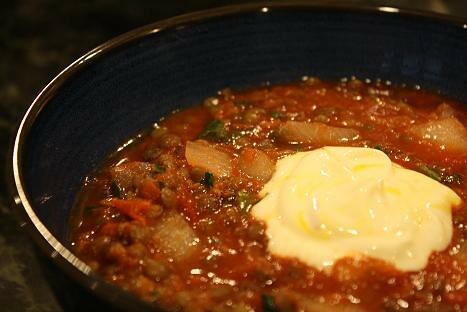 First up, I tackled a lentil soup recipe by 101 Cookbooks that Heidi calls “Lively Up Yourself Lentil Soup”. (Have I mentioned my love for this site and Heidi Swanson’s lovely way of cooking? Not this week, I haven’t!) It has only a few ingredients that are easy to find. Plus this recipe is begging for you to add your own flavor to it, so mix it up! Cooking attempt #1 with my star ingredient was a success. I would totally make this soup repeatedly and serve it to anyone (and everyone). She also suggested making a Saffon Yogurt, which I went for. I used saffron in last week’s Paella recipe, so I figured I might as well use it again. I would never have thought to use saffron in this way, making this a really cool technique that I was excited try! All in all, this dish was a cinch to make and I found my bowl empty (too quickly) and myself satisfied. The soup came together in no time and cooking the lentils was definitely the longest part of the recipe. I think it took be a little over an hour to make, which is awesome compared to a lot of soup recipes I’ve blogged about over the past 4 months. Healthy? Check. Easy? Check. Delicious? Big Check. Leftovers calling to me in the fridge? Happy Check! Approved for Mom? Definite Check. Click here to try out this recipe and see step by step instructions and enjoy! This dish was actually what inspired me to add lentils to my culinary journey. In looking at my regular cooking blogs, someone linked to this recipe and I kept thinking about it. This dish came from the site Leite’s Culinaria. 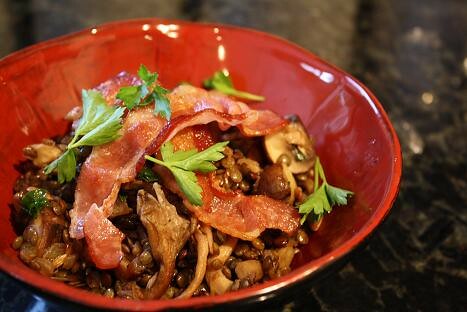 I knew lentils were foreign to me, but I figured that even if I didn’t like them, bacon would make them better. I was pleasantly surprised by this recipe and how tasty it was. Great flavor abounds and the bacon was such a lovely touch on the top (that could easily be omitted without losing any flavor). Plus I enjoyed cooking with cremini and oyster mushrooms, which I’d never used before. The oyster mushrooms were definitely strange-looking but fun to work with. Click here to give this a try and to see the recipe and step by step instructions. I know this will be shocking for most of you to read (or not), but my third recipe is one by Giada de Laurentiis. I happened upon this recipe on the Food Network site while searching for recipes with lentils. Since I’ve yet to find a Giada recipe that did not wow me, I added this one to my list. I have to say that once again, Giada succeeds. This dish was healthy, full of vegetables, and was a really light and refreshing meal. It was the perfect recipe to end my week of cooking with lentils. The last two recipes I made were wonderful and very hearty and this one rounded it out by giving a sweeter, salad option for cooking with lentils. Red peppers, scallions, cucumbers, grapes, and lemons all complimented the lentils quite well. I was surprised at how much I liked the recipe, just because I wasn’t extremely familiar with lentils and the idea of pairing them with grapes sounded a bit strange. As soon as you take one bite though, it all makes perfect sense. This is a lovely way to eat your vegetables, get in those healthy lentils, and not feel weighed down by the end of the meal. I highly recommend this dish and am proud that I’ve found 3 recipes this week that might just change my mom’s mind about lentils. I loved them all and hope you give them a shot. I would love to know if you make any of them and what you thought! 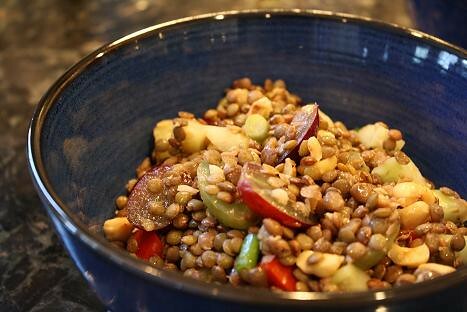 Click here for this wonderful lentil salad recipe and step by step instructions.